I have no idea if anyone is even interested in this but I am. 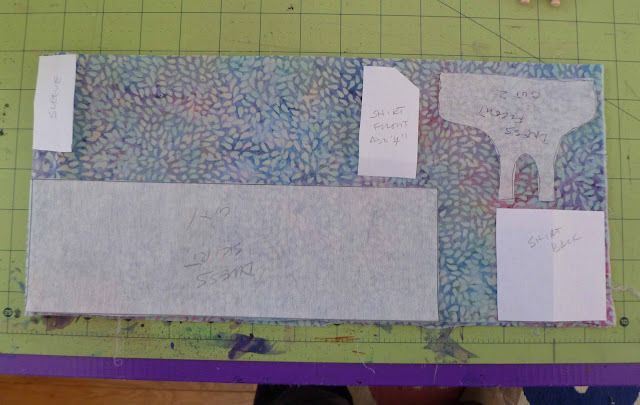 I thought I'd do a short post on my process returning these dolls to childhood. 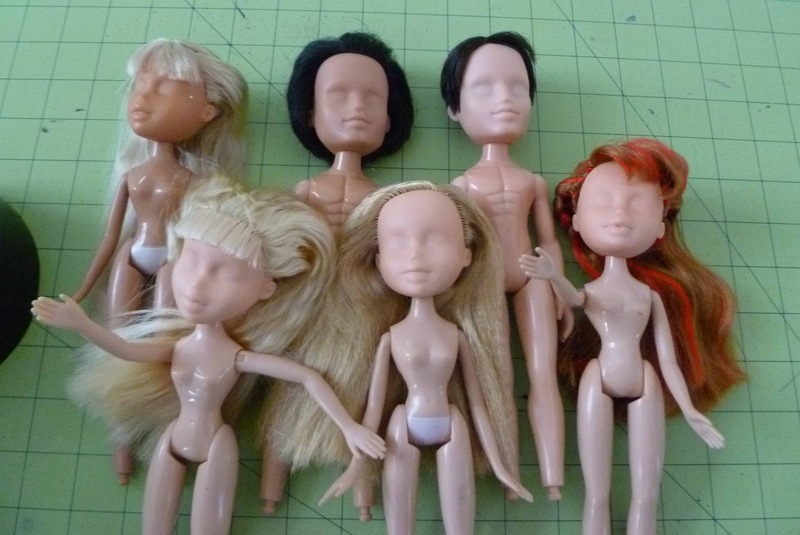 All of these dolls are used - sometimes very used and abused. Some have had "haircuts" some have had "custom painting" on their faces. This is a lot of five I paid too much for just because I was desperate for that red headed doll. 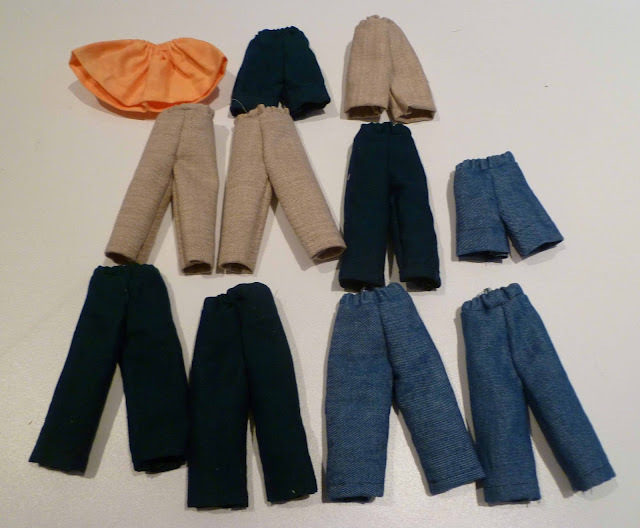 The first thing I do is take off their clothes and shoes (feet), arrange them nicely, photograph them and put the shoes, clothes and accessories up for sale on eBay. This helps defray the cost. Next everyone goes in the doll Jacuzzi to soak in hot water with soap up to their heads for an hour or so. 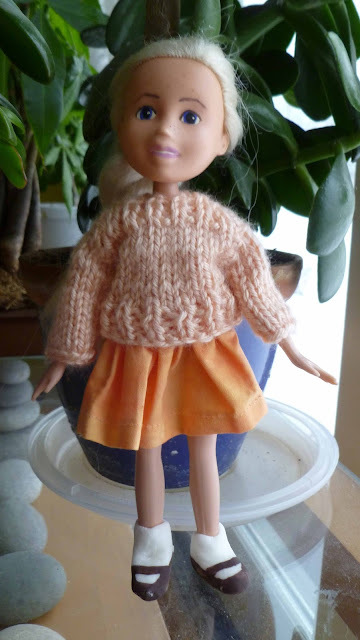 I usually make under 6 dolls at a time. First I remove their factory faces (yucky) and wash their faces, shampoo and condition their hair and let them dry for 24 hours. I use real shampoo and conditioner to get the hair soft and help with the brushing. This batch had had their faces removed and hair brushed. The doll on the far right had actual red, red hair mixed in with a more natural color. I tried to remove some (not successful) when decided to do two braids that would meet in the back. This helped camouflage "some" of the colored hair. Next comes face painting. Since I can't film myself I am embedding a great face painting video from Sonia Singh who was the artist I first saw recreating these used dolls and giving them a new more natural life. These poor dolls had stiletto heels, boots and huge platform shoes when I bought them. Now I made them new shoes. I also learned this from Sonia Singh. They are made with a 50/50 mix of 100% silicone caulk and corn starch. I make mine in just the white then paint them to look like shoes. 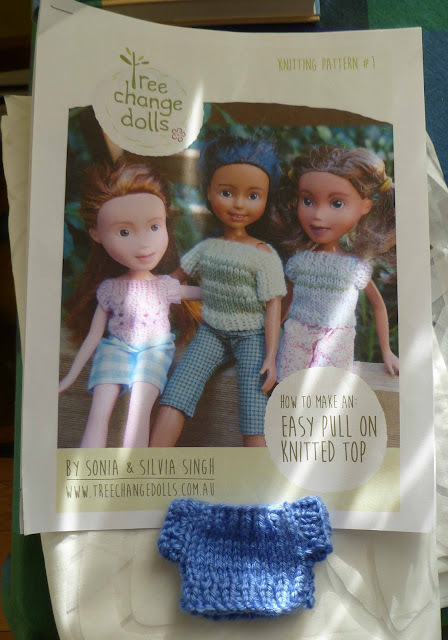 You can get step by step directions on Sonia Singh's YouTube channel. 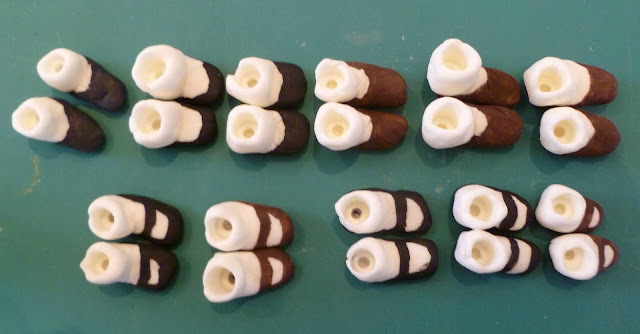 I use the same 6 dolls over and over to make shoes because their legs and foot knob are coated in Vaseline. I call them the "shoe girls". I think they look so cute as if they were baggy socks and soft shoes. 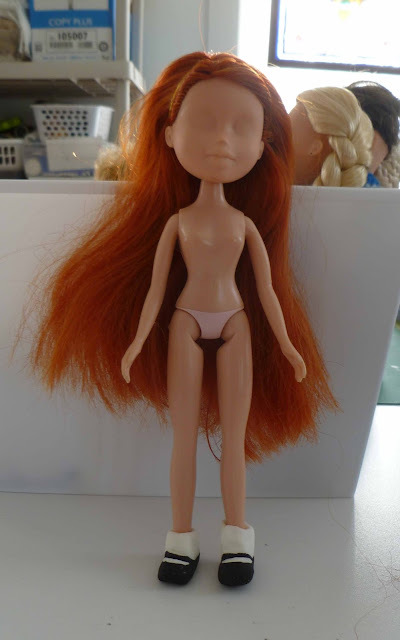 Now I have a doll that is ready to go except for clothing. This is my redheaded doll with shoes. Soon she will have a face and clothes and a place on honor on my desk. 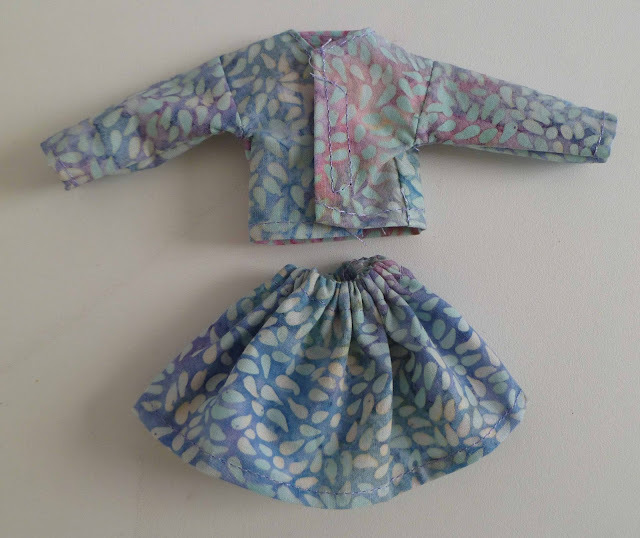 This tiny piece of batik with be a sun dress and a skirt and blouse. 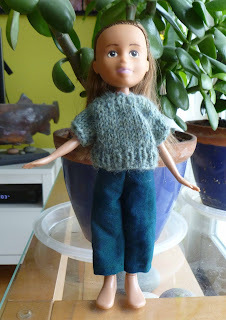 Slacks, jeans, shorts and a skirt above and a knitted sweater below. 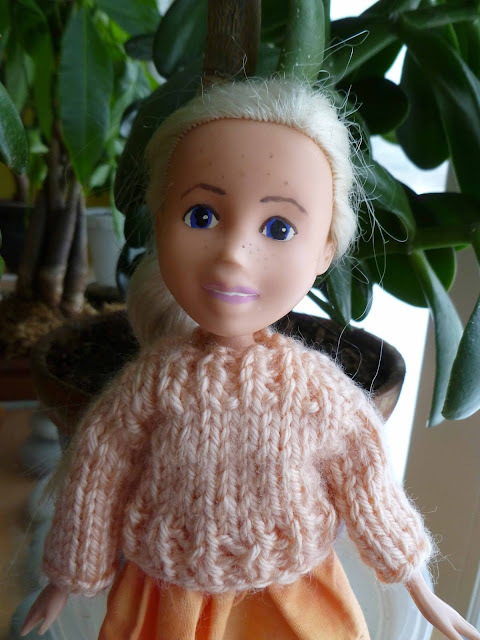 Doll 12 has freckles across her nose and cheeks as well as her forehead. 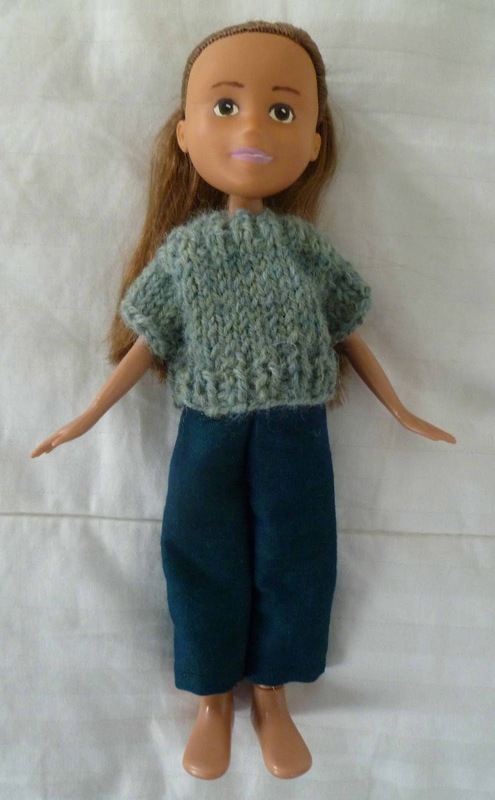 If you are interested in buying one of my dolls, just leave a comment and I will get back to you. They are 10" tall. I think these are the last of the doll posts although not the end to my "making"
God, what intensive work are you doing ... and it is not simple at all. Beth, Congratulations! 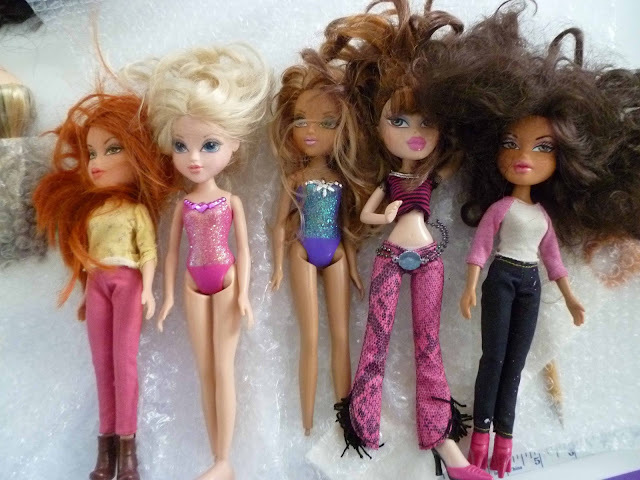 I love what you've done to transform these dolls. Wish that society would stop pushing the ridiculous style dolls on little girls. Even the overpriced Cabbage Patch dolls were a better choice than the teen bombshells. Wahoo, look at you! Having so much fun with your doll tribe! You are just so creative! Good to see you having fun! That was a lot of nit picky work and you accomplished it beautifully.